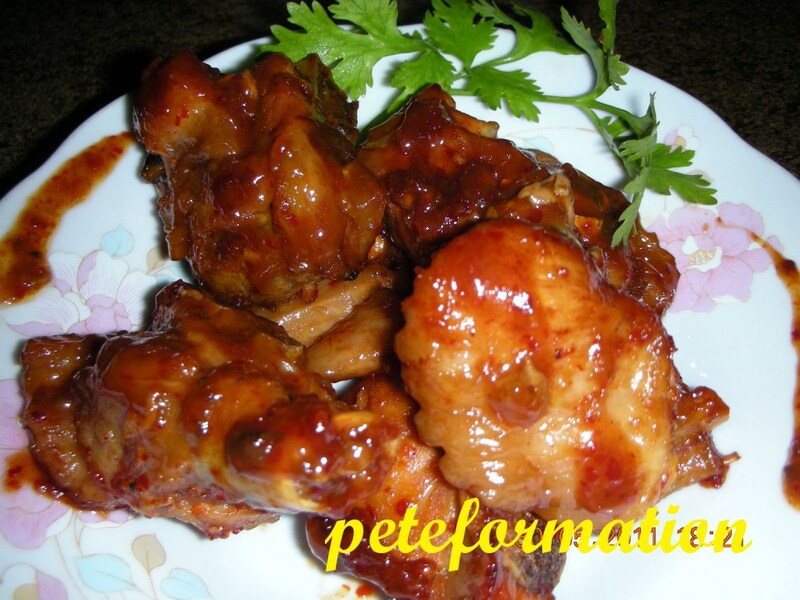 I adapted this recipe from North Carolina BBQ Turkey Wing Post. At first, after buying this frozen turkey wing, I had no idea what to cook it with. A quick search on google gave me some ideas needed. The taste is almost similar to buffolo wings but turkey is tastier because it has more oil in it. LOL! This is the first time I use Apple Cider vinegar in my recipe. Apple cider vinegar (Mother of all vinegar, unpasturized) is very good for people with sinusitis. It helps to alleviate sinusitis problem by thinning the mucus and also kills bacteria that infect our respiratory system. Apple cider vinegar gave this dish additional out of this world flavours! mmmm, nice! Note : Please boil turkey wing in pressure cooker or steam it so that the meat is tender before cooking. It will be tastier. I fried these wings but you can also marinade it and BBQ them if you want too. Heat up wok and add in some vegetable oil. Saute garlic until fragrant and add in the turkey wings. Fry for a short while. Add in the rest of the ingredients and stir until they mix well. Let the wings brown a little. Serve with steamed rice. Verdict : Turkey wings if cooked in the right way are tastier than chicken wings. sounds and looks delicious. Isn't google fantastic? errr, but i think this is a good example of east meet west, because there's not a big gap there..
gonna try this with chicken wings :) I bet it's just as yummy...btw, apple cider vinegar can also be used to cure mouth ulcer, I heard. Don't know how far true it is though. sounds good, looks good..i heard that some people also used apple cider vinegar in replace of assam jawa.